Technician working in a prosthetics workshop. Image via NHS Photo Library, used under Crown Copyright. 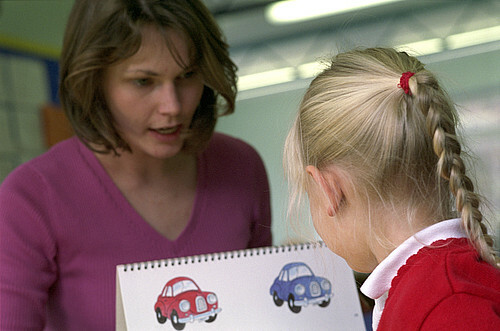 Stoke Speaks Out, run by speech and language therapists, is tackling the high incidence of language delay identified in young children across Stoke-on-Trent through a preventive, multi-agency approach. In 2002 local studies identified that 64 per cent of children were entering nursery with significantly delayed language skills. By 2010 this had improved to 39 per cent of children. Speech and language delay has a direct impact on children’s development and educational outcomes, health and well-being. With their focus on food, dietitians are on the frontline of the fight against the nation’s obesity epidemic. They lead multi-agency strategies to tackle adult and childhood obesity, inform national guidance and policies, support clear evidence-based information for the public, and work on a range of local programmes to change behaviour and cut obesity. The British Dietetic Association is behind a campaign to encourage retailers to stop putting junk food at the till, where it leads to impulse purchases and pester power from children. As a result, some supermarkets have stopped all sales of junk food at checkouts. Radiographers lead the delivery of the NHS Breast Screening Programme which calls women between 50 and 70 years old for a mammogram every 3 years to pick up early signs of breast cancer. Radiographers perform the screening and also use the opportunity to teach women how to recognise the early signs and symptoms of breast cancer. Community-based falls prevention programmes tackle one of the biggest health issues facing older people, and reduce costs through hospital admissions. Physiotherapy-led falls prevention services have contributed to reductions in admissions due to falls in the home of 32 per cent, falls in residential institutions of 27 per cent and falls in the street of nearly 40 per cent. Occupational therapy is both cost effective and beneficial for older adults with dementia. It improves clients’ mood, quality of life, health status and sense of control over their lives. Most of the AHPs are using ‘making every contact count’ to have tailored conversations about improving health and wellbeing and supporting clients to make lifestyle behaviour changes. For example, podiatrists use the conversation time they have whilst treating a client to talk about issues such as stopping smoking, losing weight or being more active. Speech therapist at work. Image via NHS Photo Library, used under Crown Copyright. Acupuncturists carry out over 4.5 million treatments and research has shown they can improve health and wellbeing and support clients to make better lifestyle and better health choices. I would like to see Acupuncturists, who meet WHO standards of training, being seen as an AHP - British Acupuncture Council members meet these standards. I hope we can be involved in this conversation and action going forward. Definitely need to release the potential of AHPs - well said. A very interesting and informative blog. I thought it reflected the wide ranging nature of Allied Hleath Professionals (AHP) and their interconnected areas of work with AHP, Public Health England, and beyond.. I saw in the blog the reference to working with the clients around every contact counts, and I was just wondering if it needed to be seen beyond this? I am just thinking of the work AHPs do when working with clients to plan, deliver and develop the services. This takes us away from the illness and moves to better services with co produced aims and outcomes. Thanks Bren, I totally agree with you about the impact of AHPs at every part of the pathway including their role in planning and developing services. This afternoon I am joining with the acting Chief Health Professions Officer and other AHP colleagues as part of planning around rehabilitation services to see how public health and prevention can be integral to all aspects of rehabilitation.